He is the scourge of the adult generation, and the favorite friend of two to five year olds across the world. So how could a six foot, four inches tall chubby purple dinosaur generate such diverse reactions? Barney was the creation of Sheryl Leach, a mother who was dismayed at not being able to find entertaining, interactive videos for her child. She created the character in 1988 and he was placed on public television as a tool for helping to develop the cognitive, emotional and social skills of young children by engaging them in songs, problem solving and physical activity. The idea was that by engaging the children in a playful banter and fun-filled setting, Barney could subtly teach the children, exposing them to concepts of relating to others and working together in a positive environment. Each episode of the television show “Barney and Friends” had a specific theme, and this theme was the basis for games, rhymes, songs and other activities. At the conclusion of the episode, Barney spoke directly to the children viewing at home, reinforcing the theme. The response to the show and the level of its popularity grew to heights never contemplated. Soon Barney dolls were under Christmas trees everywhere, as were games, puzzles and musical videotapes. Barney was everywhere and kids couldn’t be happier. Not everyone, however, was delighted with the Barney experience. Many parent quickly grew tired of the dinosaur as their children watched him and parroted his incessantly. Much of the general public struggled to understand the children’s fascination and therefore developed an enormous resentment towards the character. 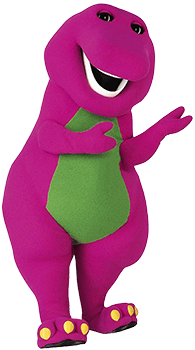 Gradually, an enormous amount of resentment towards the character developed and anti-Barney sites sprung up all over the Internet.